Weeping Angels are one the most dangerous enemies of the Doctor. They’re not violent like Daleks and Cybermen but that doesn’t make them sweet as well. These species look like your regular Greek angel statue (the ones who can be seen crying in tombstones). But what makes them terrifying isn’t their grimacing faces but their ability to take you back in time and trap you there until you die. Weeping Angels look like statues of angels in the cemetery. They are gray in color and wear Grecian robes and a Grecian hairstyle. They also have very big angel wings. 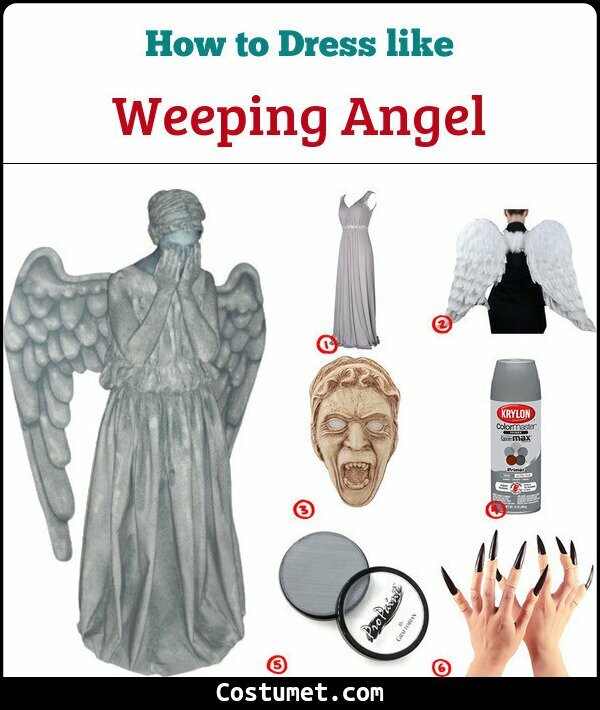 Here’s everything you need to look like a Weeping Angel. 1 Gray Grecian Dress A Weeping Angel wears a simple Grecian dress. Its simplicity adds to the angel’s subtle scary aura. 2 Angel Wings A Weeping Angel may be sinister but it still has beautiful angel wings. 3 Weeping Angel Mask Show everyone your grimacing angel face with this mask. 4 Gray Spray Paint Use this gray spray paint to turn your wings and mask gray to match everything else. 5 Gray Body Paint Use this body paint to turn your whole body gray like granite. Weeping Angels do not talk (except for Angel Bob who was voiced by David Atkins) but one of the unsung actresses who played this deadly statue is Sarah Louise Madison. The Demogorgon looks beastly and has no visible face. Its whole head is its mouth and it opens like flower petals when it attacks or feeds.